I was ready to go destroy the glass on this sacrificial 58mm filter. Then looking at it I wondered how they go it in there in the first place. It certainly wasn't using glue. There is a retaining ring that holds the glass to the filter. On either side is a tab. The tabs are where you apply pressure and turn the ring counter clockwise. This unscrews the retainer. To remove it I used the art foam-screw driver technique. Placing the filter on the foam prevents skidding. I then use one of my little fingers to press the ring down on the foam to lock it in place. 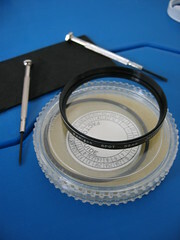 With a set of flat head precision screw drivers I rotate the ring counter-clockwise. This unlocks the ring and allows me to use one screw driver from then on. If you don't want to do those contortions, find yourself a pair of circlip pliers that can go to the proper diameter. McMaster-Carr calls them retaining clip pliers. There is also a spanner version which are locking. They have two teeth like a protractor that will hold the tabs as you spin it. Speaking of which, a drawing compass may be easier to find.